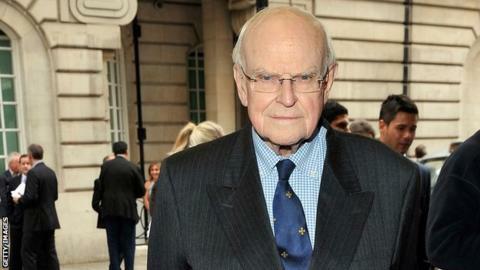 Professor Sid Watkins, who was at the forefront of Formula 1 safety for more than 30 years, has died aged 84. The neurosurgeon, who was a close friend of the late three-time champion Ayrton Senna, served as the sport's medical delegate from 1978 until 2004. Watkins was instrumental in introducing many of the safety improvements in the sport during that period. As trackside doctor, he played a major role in saving the lives of several grand prix drivers after heavy crashes. Among them were Ferrari's Didier Pironi at the 1982 German Grand Prix, Jordan's Rubens Barrichello at Imola in 1994 and McLaren's Mika Hakkinen at Adelaide in 1995. "It was Sid Watkins that saved my life in Imola 94," said Barrichello on Twitter. "Great guy to be with, always happy. Thanks for everything you have done for us drivers. RIP." Watkins's replacement as F1 medical delegate, Gary Hartstein, told BBC Sport: "Sid was absolutely the most charismatic and extraordinary problem-solver I've ever met. "What he got done was extraordinary - but it was the way he got it done in the face of extraordinary opposition at the time. He kept pushing and pushing so hard to the extent that it is now accepted as 'the way'." Watkins worked in F1 alongside his full-time job at Whitechapel Hospital in London. He was appointed chairman of the FIA Expert Advisory Safety Committee, which was set up in 1994 following the deaths of Austrian Roland Ratzenberger and Senna on successive days after Barrichello's crash at the 1994 San Marino Grand Prix. Working closely with then-FIA president Max Mosley and race director Charlie Whiting, Watkins was instrumental in transforming safety in F1 - there have been no driver deaths in the sport since Senna on 1 May 1994. After stepping down as F1's medical delegate in 2004, he continued to have an involvement in F1 safety with governing body the FIA. Last year, he stepped down as president of the FIA Institute, but had continued in an honorary role. FIA president Jean Todt said: "This is a truly sad day for the FIA family and the entire motor sport community. Sid was loved and respected in equal measure by all those who knew and worked with him. We will always be grateful for the safety legacy that he has left our sport." Watkins was given a role in F1 in 1978 by Bernie Ecclestone, now the sport's commercial boss and then the head of the now-defunct teams' organisation, the Formula One Constructors' Association (Foca). "Bernie choosing Sid to become the Foca surgeon in 1978 was quite fortuitous," said Hartstein. "He channelled all the energies of the team bosses of the time and turned it into the structure we now all take for granted. "When Max set up the Advisory Safety Committee, that's when it all got completely exploited. After '94 it became very scientific." McLaren chairman and former team boss Ron Dennis said: "Today the world of motor racing lost one of its true greats. "No he wasn't a driver. No he wasn't an engineer. No, he wasn't a designer. He was a doctor and it's probably fair to say that he did more than anyone, over many years, to make Formula 1 as safe as it is today. "Many drivers and ex-drivers owe their lives to his careful and expert work, which resulted in the massive advances in safety levels that today's drivers possibly take for granted." Jody Scheckter, the 1979 F1 world champion, added: "Most of the time I spent with Sid was in 1979 and 80 when we worked together on all aspects of safety. "The thing that stand out for me is the way he went against the politics in racing to achieve a safer environment for the drivers. That takes a lot." Watkins was a well-liked character, with a ready smile, who became close to many drivers - and none more than Senna. He recounted in his autobiography that he had tried to persuade Senna to retire in a conversation at the scene of Ratzenberger's accident. Senna broke down at the crash scene and cried on Watkins' shoulder. Watkins wrote that he said to Senna: "What else do you need to do? You have been world champion three times, you are obviously the quickest driver. Give it up and let's go fishing." Senna replied: "Sid, there are certain things over which we have no control. I cannot quit. I have to go on." Twenty-four hours later, Watkins attended to Senna himself after the Brazilian's own fatal crash. Senna's nephew Bruno, who now races for Williams, said on Twitter: "RIP Prof. Sid Watkins. Sad news for us who stay behind."